NATO has been engaged in continuous and systematic transformation for many years to ensure that it has the policies, capabilities, and structures required, in the changing international security environment, to deal with current and future challenges, including of course the collective defence of its members. With Allied forces engaged in operations and missions across several continents, the Alliance needs to ensure that its armed forces remain modern, deployable and sustainable. The Alliance’s 2010 Strategic Concept sets out NATO’s strategic priorities and defines the Organization’s vision of Euro-Atlantic security for the next decade. It provides an analysis of the strategic environment and a framework for all Alliance capability development planning disciplines and intelligence, identifying the kinds of operations the Alliance must be able to perform and setting the context for in which capability development takes place. Please see the full topic page for more information on improving NATO capabilities, including: "Meeting immediate and long-term challenges", "Understanding the procedures", "The bodies involved in decision-making", and "The development of capabilities over time". NATO Response Force ("The NRF has the overarching purpose of being able to provide a rapid military response to an emerging crisis, whether for collective defence purposes or for other crisis response operations.The force gives NATO the means to respond swiftly to various types of crises anywhere in the world. 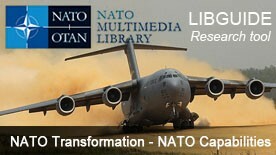 It is also a driving engine of NATO’s military transformation."). See also the NATO Response Force (NRF) page and the Q & A page by the Allied Rapid Reaction Corps (ARRC). NATO on Duty (interactive map) - access to information about NATO's key capabilities, such as air-, missile- and cyber-defence, special operations forces, precision munitions, maritime surveillance, etc. NATO ACT - "Allied Command Transformation’s mission is to contribute to preserving the peace, security and territorial integrity of Alliance member states by leading (at the strategic command level) the transformation of military structures, forces, capabilities, and doctrines to improve the military effectiveness of NATO. "TRANSNET is the NATO Allied Command Transformation Network Portal. Supreme Allied Commander Transformation (SACT) , was created in 2002, in the overall process of reform of NATO’s command structure. He is one of NATO’s two strategic commanders and the commanding officer of Allied Command Transformation. In 2012, Supreme Allied Commander Transformation, General Stéphane Abrial, briefs the press on Smart Defence. In 2013, General Jean-Paul Paloméros said that his top three priorities as Supreme Allied Commander Transformation were to foster Allied interoperability and capabilities and bolstering cooperation with partners. (Interoperability, capabilities, partnerships top priority for Gen. Paloméros, 14 January 2013). In March 2015, Supreme Allied Commander Transformation in partnership with the Atlantic Council published a White Paper: NATO Transformation Seminar 2015: Next Steps in NATO’s Transformation: The Warsaw Summit and Beyond. The NATO Emerging Security Challenges Division teamed up with Carnegie Europe to organize the conference The World in 2020 – Can NATO Protect Us? The Challenges to Critical Infrastructure. Threats to critical infrastructure, such as cyber attacks international terrorism and attacks on energy supply, can be devastating to the livelihoods of modern societies and cannot be met by military means alone. The conference with renowned speakers from NATO, academia and national administrations discussed NATO’s role in meeting security challenges to critical infrastructure.